The Olive-sided Flycatcher is a rather large (18 to 20 cm) flycatcher, with a large head and a proportionately short tail. Plumage is brownish-olive above (browner on juveniles) with a dull white to yellowish throat, breast, and belly. Streaked or mottled patches on the sides of the breast are dark and distinct from the lighter center. Sexes are similar, but may be separable in the hand by wing chord length, 96 to 109 mm (females) and 103 to 117 mm (males) (Howell et al. 1987). The song is a loud, ringing whistle, rather easily imitated, delivered by the male generally from the top of an upright dead snag or living tree such as balsam fir (Abies balsamea), spruce (Picea spp. ), tamarack (Larix laricina), or other pointed tree, often the tallest in the area. Most observers use the mnemonic "quick-three-beers" (Peterson 1980) to recall the song. The song is often heard as a foreshortened "free beer." The call is a trebled "pip-pip-pip" (Peterson 1980). Oologist V. Burtch told Bent (1942) that these notes "...seemed to be made mostly by the female in the vicinity of the nest and that all the nests he found were located after hearing these notes." Head (1903) described another vocalization as being "more like a twitter, and was uttered during excitement, chiefly when the young were learning to fly. It sounded like "why, why, why," repeated very rapidly a number of times. Sometimes this note was given as a prelude to the real song..." Bent (1942) also describes a two-syllable song, similar to the Eastern Wood-pewee's (Contopus sordidulus) in quality: "The notes may be whistled as 'too-wee' in ascending pitch, slightly suggesting the [Rufous-sided] towhee's (Pipilo erythrophthalmus) notes." The most distinguishing features to separate this species from other flycatchers are the song and white patches on the rump, when exposed. Otherwise, in the hand, Olive-sided Flycatchers can be separated from the wood-pewees (Contopus sordidulus and C. virens) by the longer (96 to 117 mm) wing, and from Greater Pewee (C. pertinax) by plumage (white tuffs on the sides of the rump), tail length (63 to 74 mm), and by the horn-colored to blackish lower mandible. 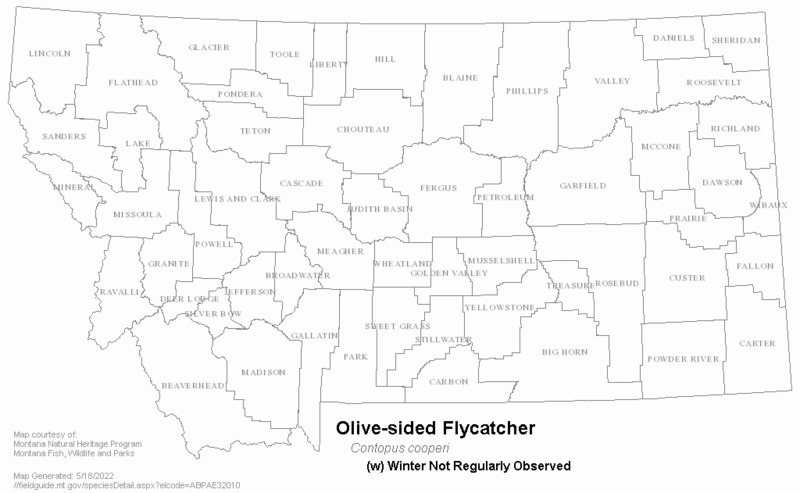 Arriving in May, the Olive-sided Flycatcher can be found in Montana through the summer months. With the longest migration route of any flycatcher to breed in North America, Olive-sided Flycatchers depart early, leaving for their wintering grounds in August (Altman 2000, Montana Bird Distribution Committee 2012). One September record exists of an individual reported southwest of Helena in 1991 (Montana Bird Distribution Committee 2012). Area specific information from the Bozeman area indicates fall migration dates from August 25 to September 10. A species that generally breeds in the montane and boreal forests in the mountains of western North America, Olive-sided Flycatchers are highly adapted to the dynamics of a landscape frequently altered by fire. They are more often associated with post-fire habitat than any other major habitat type, but may also be found in other forest openings (clear cuts and other disturbed forested habitat), open forests with a low percentage of canopy cover, and forest edges near natural meadows, wetlands, or canyons (Hutto and Young 1999, Altman and Sallabanks 2000). Their affinity for forested edges near water may be a product of a higher presence of flying insects in these areas (Altman and Sallabanks 2000). They are a species common in spruce and aspen (Populus tremuloides), but are uncommon in mixed-conifer, ponderosa pine (Pinus ponderosa), pine-oak (Pinus-Quercus), and cedar-hemlock (Cupressaceae-Tsuga) forests, and rarely present in lodgepole pine (Pinus contorta) or pinyon-juniper (Hejl et.al. 1995, Casey 2000). 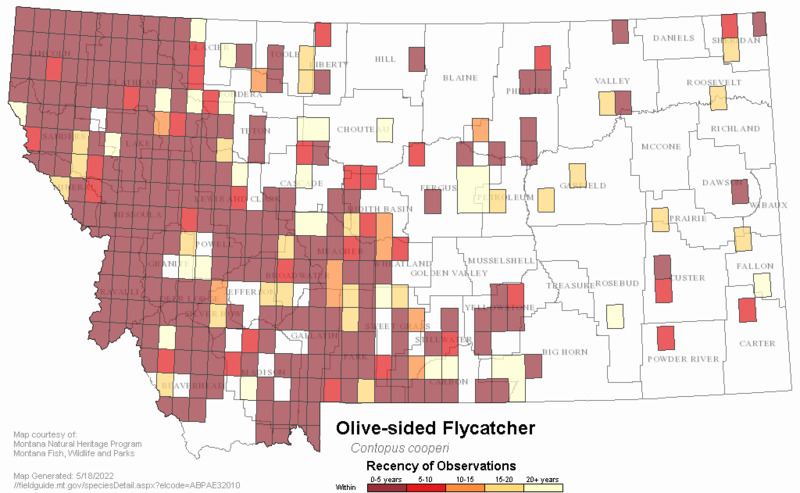 No information is availablae regarding the food habits of Olive-sided Flycatchers in Montana. Information from other studies in the species' range state foraging takes place primarily by hovering or sallying forth, concentrating on prey available via aerial attack. They generally launch these aerial attacks from a high, exposed perch atop a tree or snag. Like others in the flycatching guild, this bird is a passive searcher, looking for easy to find prey, but is also an active pursuer, attacking prey difficult to capture (Eckhardt 1979, Terres 1980). With a diet made up almost entirely of flying insects, the Olive-sided Flycatcher has a special fondness for wild honeybees and other Hymenoptera (Beal 1912, Forbush 1927, Bent 1942, Terres 1980). Beal (1912) examined the contents of 69 stomachs, collected in 12 states and three provinces, and found that Hymenoptera comprised a substantial portion of the diet each month. The fewest Hymenoptera were taken in May, when they amounted to 74.5% of the stomach contents. The average Hymenoptera consumption for the season from April to September was 82.5%. Of all birds examined during that survey, not one species subsisted exclusively on one order of insect. Winged ants were found in ten stomachs and entirely filled two of these. A few parasitic species were identified. Of special interest were 63 honeybees (Apis mellifera), found in 16 stomachs (25% of the entire sample). Other insects included beetles, Diptera (flies), Hemiptera (bugs), grasshoppers, moths, and dragonflies. In a study of the arthropod food of 25 species of forest-inhabiting birds in California from 1962-68, Otvos and Stark (1985) found that Coleoptera (beetles) were the most common food of the Olive-sided Flycatcher. 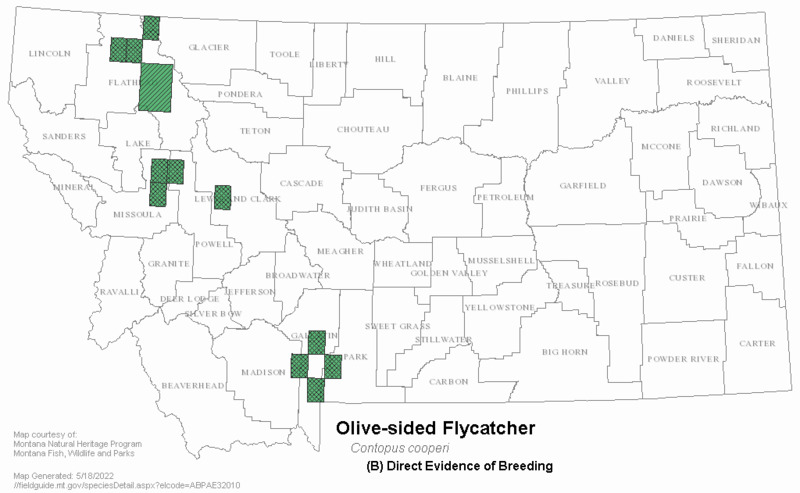 Currently no ecological information exists for Olive-sided Flycatchers in Montana. In other areas in the species' range, ecological information indicates they are usually territorial in nonbreeding areas (Stiles and Skutch 2003) and may display strong year-to-year site fidelity on the breeding (Altman 1997) and wintering grounds (Marshall 1988, Altman 1997). In a study of 16 insectivorous, aerially-foraging neotropical flycatcher species that are seasonally sympatric in the humid Caribbean lowlands of Costa Rica, Sherry (1984) found that migrants are more opportunistic while wintering than the year-round residents. 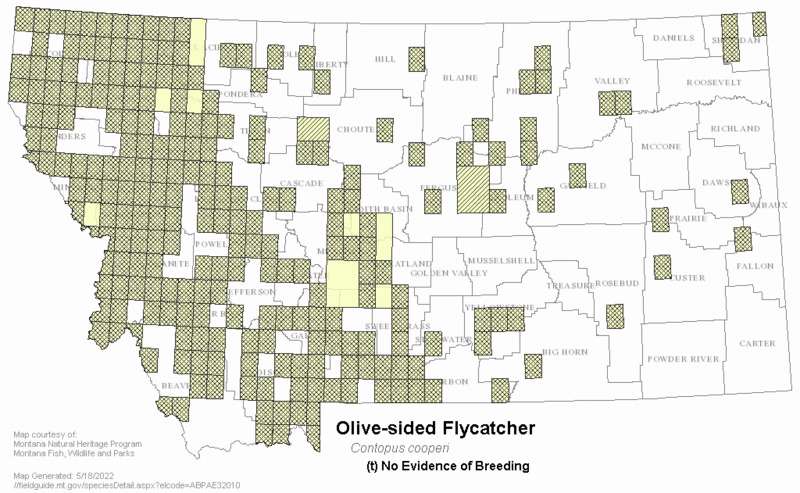 Records indicate direct evidence of breeding in Montana in July and August, with breeding behavior starting in May shortly after spring arrival (Montana Bird Distribution Committee 2012). Egg dates are probably similar to those for Colorado: June 16 to July 20. Johnsgard (1986) notes that fledged young have been reported in Jasper National Park as early as July 1, suggesting earlier nesting dates are possible in Montana than have definitively been recorded. The usual clutch size of three is confirmed in the state (Montana Bird Distribution Committee 2012). Other reproductive studies in other areas of the species' range state courtship includes territorial fights between males, and males pursuing females across the canopies of coniferous forests. Courtship continues for at least two weeks until nest sites are chosen and pairing is completed (Bent 1942). Breeding males have a cloacal protuberance and breeding females a brood patch from April to August (Howell et al. 1987). The short subelliptical eggs of the Olive-sided Flycatcher are creamy-white, buff, or pink, and lightly wreathed on the broad end with brown or gray blotches (Harrison 1978). They are generally smooth, non-glossy and 22 by 16 mm in size (Baicich and Harrison 2005). The nest, a loosely formed cup of twigs and grasses, is sometimes comprised of lichens of the genus Usnea, and is lined with finer plant materials and hair. Nests are placed most often in conifers (Harrison 1978, 1979), on horizontal limbs from two to 15 meters from the ground (Harrison 1979, James and Peck 1987). In Ontario, nests were found in black and white spruce (Picea glauca) (14 nests), jack pine (Pinus banksiana) (two nests), and balsam fir (one nest) (James and Peck 1987). Adirondack nests were built on an outer branch from 7.6 to 13.7 meters high in balsam fir or spruce (Peterson 1988). Even though the nest is bulky, it is well concealed and rather difficult to find. Clutches of three (rarely four) eggs are laid (Harrison 1978). Egg dates are June 6 to 24 in Ontario (James and Peck 1987), June 9 to 27 in New York, and June 14 in Vermont (Fichtel 1985). This bird is single-brooded and has an incubation period of 14 to 17 days in New York. Incubation is by the female. Nestlings leave the nest at 15 to 19 days (Harrison 1978), with New York State records of unfledged juveniles on June 22 and fledglings from July 10 to 24. Although young rarely fledge before the end of July, flycatchers can become very difficult to find as singing begins to slow during late June (Peterson 1988). Management actions in Montana are currently limited by lack of conclusive information about the specific relationship between species' habitat use and reproductive success. It is unclear if stand replacing fire regimes or fires of less magnitude provide more appropriate habitat for successful reproduction (Casey 2000). In areas where fire suppression has reduced the heterogeneity of the forest, fire management techniques that promote a more historic pattern of disturbance would benefit the species (Casey 2000). Several other management techniques to benefit the species include retaining forested habitat around riparian and wetland habitats and retaining snags and large trees post-fire. Select logging practices that retain medium to large trees with a relatively open canopy closure may also provide appropriate habitat (Casey 2000). Altman, B. 1997. 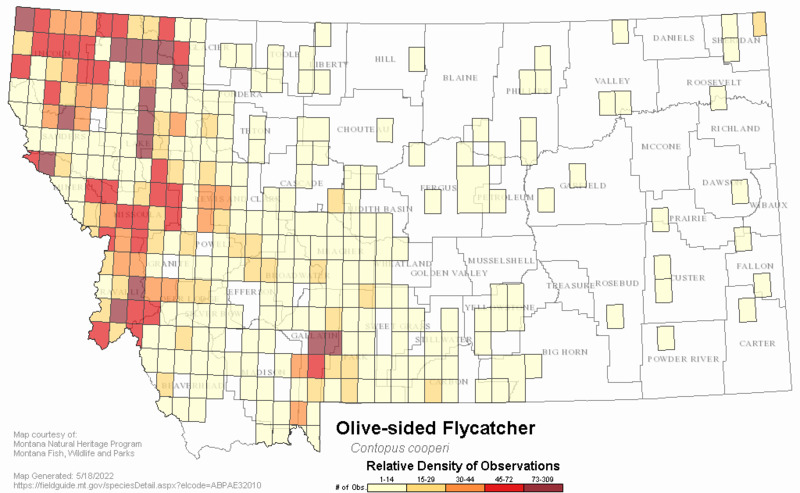 Olive-sided Flycatcher in western North America: Status review. U.S. Fish and Wildlife Service, Portland, Oregon. 59 p.
Beal, F.E.L. 1912. Food of our more important flycatchers. U.S. Department of Agriculture, Biological Survey Bulletin 44. 67 pp. Eckhardt, R.C. 1979. The adaptive syndromes of 2 guilds of insectivorous birds in the Colorado U.S.A. Rocky Mountains, Ecological Monographs 49(2):129-150. Forbush, E.H. 1927. Birds of Massachusetts and other New England States. Part 2: Land birds from bob-whites to Grackles. Massachusetts Department of Agriculture, Boston, Massachusetts. 461 pp. Marshall, J.T. 1988. Birds lost from a giant sequoia forest during fifty years. Condor 90(2):359-372. Otvos, I.S., and R.W. Stark. 1985. Arthropod food of some forest-inhabiting birds. Can. Entomol. 117(8):971-990. Peterson, J.M.C. 1988. Olive-sided Flycatcher, (Contopus borealis.) Pp. 244-245 in R.F. Andrle and J.R. Carroll, editors. The atlas of breeding birds in New York State. Cornell University Press, Ithaca, NY. Sherry, T.W. 1984. Comparative dietary ecology of sympatric insectivorous neotropical flycatchers Tyrannidae. Ecological Monographs 54(3):313-338. American Ornithologists’ Union [AOU]. 1997. Forty-first supplement to the American Ornithologists’ Union Check-list of North American birds. Auk 114(3):542-552. Fichtel, C. 1985. Olive-sided flycatcher, (Contopus borealis.) Pages 170-171 in S. B. Laughlin and D. P. Kibbe, editors. The atlas of breeding birds of Vermont. University Press of New England, Hanover, New Hampshire. 456 pp. Gilbert, F.F. and R. Allwine. 1991. Spring bird communities in the Oregon Cascade Range. U.S. Forest Service Gen. Tech. Rep. PNW-285: 145-149. Griscom, L., and D. E. Snyder. 1955. The birds of Massachusetts: an annotated and revised check list. Peabody Museum, Salem, Massachusetts. 295 pp. Hall, G. A. 1985. West Virginia birds: distribution and ecology. Special Publication of Carnegie Museum of Nautral History, No. 7. Pittsburgh, Pennsylvania. Peterson, J.M.C., and C. Fichtel. 1992. Olive-sided flycatcher, Contopus borealis. Pages 353-367 in K.J. Schneider and D.M. Pence, editors. Migratory nongame birds of management concern in the Northeast. U.S. Fish and Wildlife Service, Newton Corner, Massachusetts. 400 pp. Roy F. Weston, Inc., Bozeman, MT., and Western Technology and Engineering, Inc., Helena, MT., 1989, Stillwater PGM Resources East Boulder Project Addendum F: Supplemental Biological Studies. Final Report. December 1989. Smucker, Ty 2001. 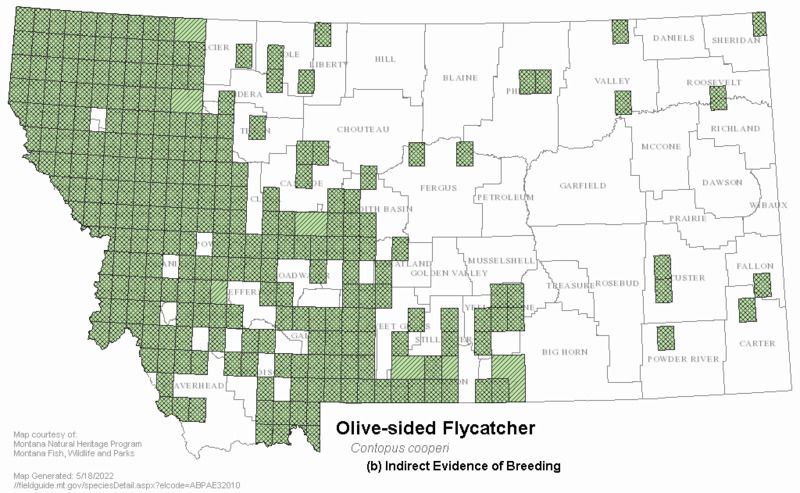 Olive-sided Flycatcher Nesting Success in Western Montana. 2001 Pilot Study. Final Report. 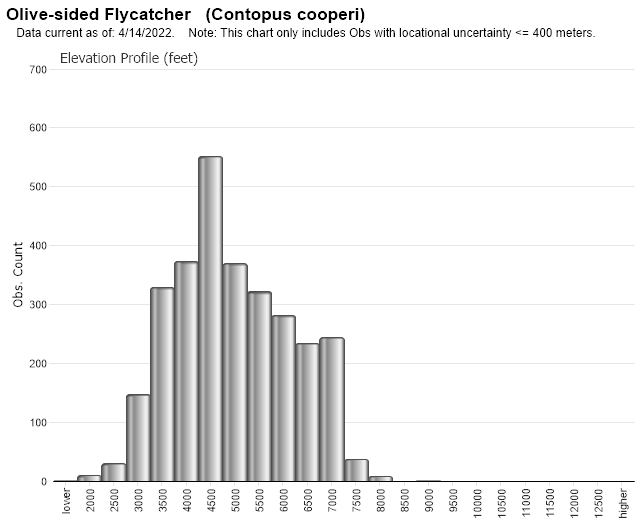 Web Search Engines for Articles on "Olive-sided Flycatcher"